I've long loved Google Maps, and especially with my travels and photo geoencoding, I often use it to further explore a place I've already visited in person. 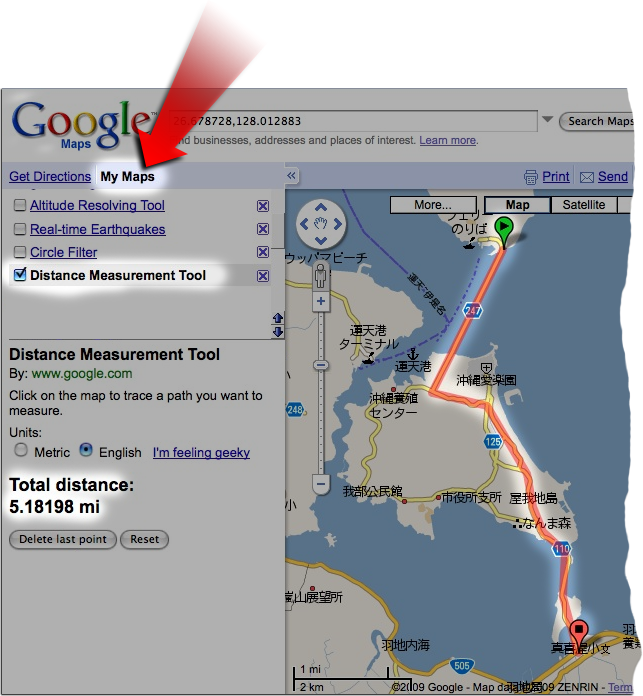 For years, though, I wondered why a distance-measurement feature was not included, since that would seem one of the first enhancements that would come to mind. I eventually created a simple distance-measurement tool myself, adding it to my online exif tool, so that when you use it to view the data for a geoencoded image, you can measure distances from the photo spot (here's an example). Still, my solution was less than ideal for general use, and so I remained perplexed and slightly frustrated. Well as yet further proof that I am an idiot, I only recently discovered that Google Maps has had a distance-measurement tool for the last year and a half. It, and hundreds of other built-in enhancements, have been hidden behind the easily-overlooked “My Maps” link. The name implied to me that it was nothing more than a way to save locations I visited often, but as I discovered last week, it's so very much more. There are so many little enhancements that I stopped counting after a few hundred. Some are universally-useful tools like the distance-measurement tool, latitude/longitude display tools, and circle/proximity tools. Some are sets of marked locations, such as real-time earthquake info, locations in Japan that offer a pretty night view, or Top 100 Highlights in Sweden (to pick three of hundreds). Some are just fun, such as Dig a Hole Through the Earth (which tells me that doing so from my place in Kyoto would put me in the ocean 500 miles off the coast of southern Brazil). I'm probably the only one in the world who didn't know about all this, but I'm posting about it anyway, just in case one or two others hadn't heard of it. You can check it out by browsing the directory of enhancements. Note that to use these features, you have to add it to your “my maps” list, which itself requires that you are registered with a (free) Google account. Well worth it. I don’t think you’re an idiot for not finding it; I think they’re idiots for hiding it! Notice that I didn’t say he wasn’t an idiot period, just that he wasn’t for failing to find certain features on a poorly-designed web page. I’ve never have looked inside “My Maps” and likely never would have, though I use Google Maps every day. Thanks for the tip. BTW, it still amuses me no end that “Type Jeffrey’s first name” was apparently proving too tricky for some of us and had to be simplified. I’m guessing that this comes from having a truly international audience, rather than readers who struggled with basic comprehension but still… it cheers me up whenever I see it. 🙂 The hardest thing to do is to see things the way your users will see them and it’s always the unexpected things that catch out designers of apps and sites. Kudos for changing it. I’ve wanted distances too on Google maps and I didn’t see it. I need to go back and check it out. Thanks for the tip! They seem to have moved this feature to the Maps Lab location rather then being under My Maps now.